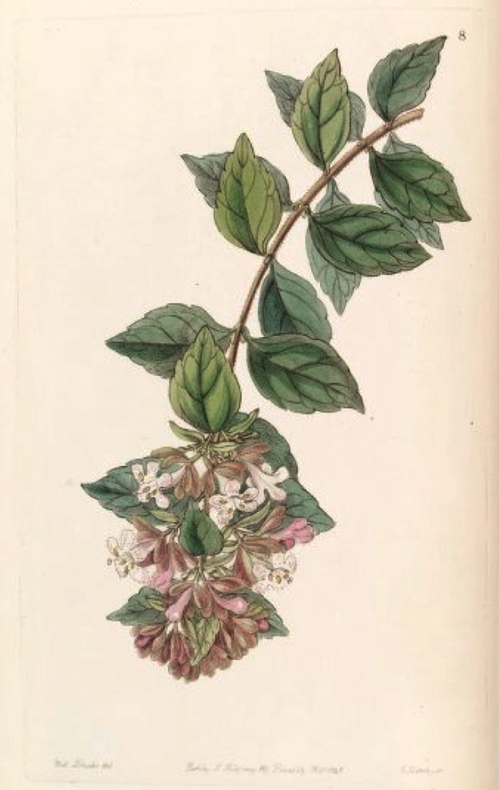 Hortus Camdenensis | Abelia chinensis R.Br. Frost-hardy, spreading, deciduous shrub with glossy, dark green leaves and terminal panicles of fragrant, funnel-shaped, pink-tinged white flowers in summer and autumn. To 1.5m. [RHSE, Hortus, Hilliers']. ‘This new shrub is thus described in the Journal of the Horticultural Society - "A small spreading bush, with deciduous, bright green foliage. The branches are very slender, covered with fine down, and deep reddish brown, when fully exposed to the sun. The leaves are opposite, ovate, distantly serrated, on very short stalks, quite smooth except at the midrib on the underside, where they are closely covered with short hairs. The flowers are pure white, something like those from the honeysuckle, and come in pairs from the axils of leaves belonging to the short lateral branches. […] It has hitherto been treated as a greenhouse plant, but will probably prove hardy enough to stand out of doors in mild winters. The soil which appears most suitable is rough sandy loam, mixed with a little peat. Being of free growth, an ample supply of water is necessary during the summer season. In winter nothing different from the general treatment of greenhouse plants is required. It is propagated from cuttings of young wood, in the usual way. From its being sweet-scented, and the length of time it remains in flower, this will be of considerable importance as a greenhouse plant; and should it prove hardy, it will doubtless be a good addition to the shrubbery in consequence of its flowering in autumn." It was received from Mr. Fortune, June 20th, 1844, as a fine dwarf shrub, found among rocks on the Chamoo Hills.’ [BR f.8/1846]. Listed only in the 1857 catalogue [T.2/1857]. Abelia × rupestris L.Späth, a hybrid between Abelia rupestris and A. uniflora R.Br., is not Macarthur’s plant.